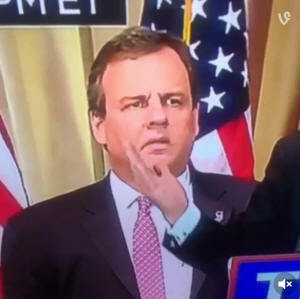 What the hell is Chris Christie thinking? When Chris Christie emerged Tuesday night in Florida to introduce Donald Trump, I wondered how the New Jersey governor would deal with being second banana, the window dressing for Trump's turn to a general election race against Hillary Clinton. Turns out, he didn't handle it so well. His death stare directed at Trump lit the Internet — okay, fine, the political Internet — afire. And not in a good way for Christie. That appearance capped a remarkably bad five days for Christie — all of which began when he threw his support behind Trump's candidacy in advance of the Super Tuesday votes. From that moment until this one, the question that people — including many longtime allies of his — have been asking is: What the hell is Christie thinking? 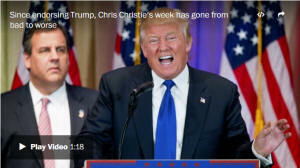 "I think what is going on in his head is that he just needed to be back in the game," said one Christie ally. "I think he thinks he can have a positive influence on Trump. I think he is totally mistaken in that regard." There's clearly a lot to unpack here. It starts with political calculation. Christie is term-limited out as governor of New Jersey in 2017. He wants a continuing role on the national stage. To that end, he assessed the GOP field, saw that Trump was the odds-on favorite to be the nominee, that the other options (Marco Rubio, Ted Cruz) were unacceptable to him and pulled the trigger. You can see the political calculation: I swallow my pride a bit to back this guy — someone who I said not that long ago was not fit for the office and would lose for sure to Democrats — since he's going to win the nomination anyway. Maybe I get to be vice president on the national ticket. Maybe I get a Cabinet gig — attorney general? — in a Trump administration. And if Trump loses, then no harm, no foul. I lined up behind the nominee. Period. The problem for Christie is that his political calculation was a little too transparent for everyone's liking. Suddenly, rather than looking like someone who simply grasped the moment better and sooner than anyone else, Christie is being cast as a rank opportunist. What an embarrassment. What an utter disgrace. We’re fed up with Gov. Chris Christie’s arrogance. We’re fed up with his opportunism. We’re fed up with his hypocrisy. We’re fed up with his sarcasm. We’re fed up with his long neglect of the state to pursue his own selfish agenda. 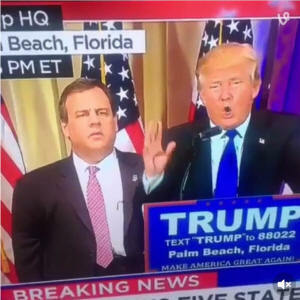 All of it left Christie bruised and battered, and even those close to him are wondering just what was going on in his head. The most generous explanation I heard for Christie's Trump endorsement — and his willingness to stand arm in arm, literally, with The Donald — is that the two knew each other long before the 2016 presidential race and are friendly. “I've gotten to know all the people on that stage, and there is no one who is better prepared to provide America with the strong leadership that it needs, both at home and around the world, than Donald Trump,” Christie said when he made the surprise announcement. Christie's thinking went something like this, according to his allies: Trump is going to be the nominee. I know him better than I know any of these other people and I like him. I'd like to be in politics in the future. So why not? The other suggestion to explain Christie's behavior is that he remains embittered about the attacks he endured at the hands of Rubio's super PAC in New Hampshire and is looking for a measure of revenge. "There's a lingering unhappiness over what Rubio's super PAC did to him in New Hampshire, and there's the unhappiness over not being able to fulfill the promise of what many thought his candidacy would be going back a few years, and that unhappiness has manifested itself, in part, in the endorsement of Trump," explained one senior party strategist granted anonymity to speak candidly about Christie's state of mind. That explanation makes sense, given that both in his endorsement and in the days following it, Christie has hammered Rubio as "desperate" and taken obvious pleasure in Trump's increasingly vitriolic slams on Rubio's appearance ("sweaty") and performance ("loser"). Combine longtime friendship, dashed dreams and a taste for revenge and maybe you to start to understand just what Christie is up to right now. Then again, maybe not. Maybe it's even simpler than that. "He needed to be relevant," said a Christie loyalist. The unprecedented spectacle on Thursday of the last Republican presidential nominee, Mitt Romney, blasting his likely successor, Donald Trump, as a "phony" and immoral "fraud" represented more than just an extraordinary moment in a surreal political year. It may be remembered as the moment that the GOP establishment's long-brewing horror over the billionaire businessman burst into open political combat and an active bid to bring him down at the party convention. "I believe with all my heart and soul that we face another time for choosing, one that will have profound consequences for the Republican Party and more importantly, for the country," said Romney, channeling former President Ronald Reagan in his stunning speech in Utah. Romney's concise, categorical takedown of Trump's intellect, character and motivation amounted to a tipping point in a long-building revolt among Republican elders now openly despairing of the former reality TV star's grip on the GOP nomination and his staunch armies of outsider voters who refuse to abandon their outspoken champion. But Trump dismissed Romney as if he was swatting a fly. "He was a failed candidate," Trump said at the Fox News debate Thursday night, branding Romney as an "embarrassment" who just wants to be relevant and get back in the political game. However, Romney was not alone. His assault won an endorsement from the previous GOP nominee, Arizona Sen. John McCain. It also came on a day when a group of prominent conservative national security experts warned darkly that Trump was not qualified to be president. And it coincided with a drive by Republican super PACs and other anti-Trump forces to halt the billionaire with attack ads. But unleashing a Republican civil war is fraught with risk, has staggering implications for the party itself and appears to fly in the face of the grim precedent of divided parties in American political history. The path Romney and his allies have chosen leaves Republicans with a dilemma, assuming Trump extends his march toward the nomination in coming primaries and caucuses -- and there is little reason to think he won't. Either they must embrace a Romney-led attempt to overturn the democratically expressed will of millions of voters and risk alienating Trump supporters who, if they reject the GOP, could effectively hand the election to the Democrats. Or they must accept Trump as their figurehead even though embracing him would change the party itself in the eyes of moderate and conservative Republicans alike who see him as the antithesis of what they believe the GOP stands for. Not all of Trump's policy positions are clear. But a party he leads would implicitly go into the general election as an anti-free trade, somewhat isolationist, immigration hardliner force that embraces economic nationalism and has unclear positions on social issues. That contrasts with the GOP's heritage as a pro-globalization, internationalist and even interventionist party laced with social conservatism and dedicated to a creed of small government. The dilemma hasn't been resolved by all of the GOP's leadership, despite the full frontal attack Romney delivered. That equivocation could dilute some of the efficacy of the anti-Trump wing's efforts. And it's far from certain that Romney, who is seen by many GOP voters as a flawed candidate who botched an attempt to bounce President Barack Obama out of office, is the best messenger for such an offensive. Party higher-ups on Thursday were sticking to the position that there could be no change to the process -- in an apparent attempt to stop the civil war from flaring out of control. "Another day, another fascinating development," Republican National Committee Chairman Reince Priebus told CNN's Wolf Blitzer. "When we get to a nominee, this party is going to support that nominee 100%. I don't care who the nominee is. Our job is to support the person who gets the majority of delegates." Other members of the Republican establishment in Washington -- who have more to lose than Romney because they are still in office -- were not quite so keen to rush to the barricades. House Speaker and Romney confidant Paul Ryan declined to endorse the former GOP nominee's warning, saying only that he would speak out if he saw conservatism being "disfigured." And Tennessee Sen. Bob Corker, the influential chairman of the Senate Foreign Relations Committee, issued a short statement pushing back at the notion that party grandees should intervene to thwart Trump. "Here's my message to the Republican Party leaders: Focus more on listening to the American people and less on trying to stifle their voice," Corker said. But one person who was happy to engage was Trump, who thrives on conflict and seemed to sense that he couldn't lose from a confrontation with an unsuccessful establishment nominee, lashing Romney as a "choker" who had begged him for an endorsement in 2012. It does seems counterintuitive that in an election that has been defined by a rejection of the Republican establishment, the man to deliver a body blow to Trump would be a symbol of the GOP elite. "I think that Romney's speech today is not going to change a single vote," said Mark McKinnon, a former strategist for President George W. Bush on CNN's "The Lead with Jake Tapper." "If anything," he continued, "it will probably harden the support that Trump supporters have because it is just another example of the establishment all these supporters are against circling the wagons." The idea of framing a strategy to thwart the will of Republican primary voters is also a troubling concept to some conservatives, even those who do not support Trump. "Win it, lose it, but don't steal it," former Minnesota governor and presidential candidate Tim Pawlenty told CNN's "Erin Burnett OutFront." Whether or not they are successful or defensible, the widening anti-Trump attacks may have important electoral implications for the Republican Party. It was, after all, the spiritual leader of the party, Abraham Lincoln, who warned in another context: "A house divided against itself cannot stand." Internecine warfare has rarely made parties prosper in presidential elections. "The short answer is it doesn't end well for that party generally," said David Karol, an political parties expert at the University of Maryland. In recent political history, splintered parties have crashed to defeat. In 1972, Democratic nominee George McGovern was a divisive figure in his party, and he won only one state. In 1964, another candidate that played to the extremist fringe of his party, Republican nominee Barry Goldwater, was also crushed. Further back, in 1912, the Republican Party split over its rejection of a comeback attempt by former President Theodore Roosevelt, who decided to go it alone with his new progressive "Bull Moose Party." A Democrat, Woodrow Wilson profited from the chaos to win the White House. "I could see Trump being a failed nominee, and the whole thing being a debacle for them with lasting consequences," said Karol. "They would probably lose the Senate, then they would lose the Supreme Court." There is also precedent in U.S. history for a party to split completely. After all, the Republican Party itself emerged after such a schism in the Whig Party in the 1850s -- in that case over slavery -- though there is no similar sign or foundational issue suggesting that this crisis is an existential one for the GOP. There is another downside from waging war with Trump: If he prevails over those who would block him, he would only emerge emboldened and would then have the capacity to change the party itself, while the party leadership would only look that much more powerless. Still, the escalating political war may be one that the GOP has to have, given the fervent anger against a string of failed establishment nominees that has stoked the grass-roots fury that Trump has been able to exploit. In some ways, the party has been at war since at least 1994 following former Congressman Newt Gingrich's Republican revolution through to the tea party challenge to establishment forces in more recent years. "We are going to have a really rocky year," said Heather Cox Richardson, a Boston College historian whose history of the Republican Party argues that several times in its past, the GOP has gone through a cycle of purging its more extreme elements. "If you are really looking long term, that implies this is something that has got to be released before the party can rebuild itself in a healthy way," she said. Richardson's advice to the party's up-and-coming leaders: "I would hide under my desk until 2020."